Önizleme boyutu: 800 × 450 piksel. Diğer çözünürlükleri: 320 × 180 piksel | 640 × 360 piksel | 1.024 × 576 piksel | 1.280 × 720 piksel | 3.200 × 1.800 piksel. 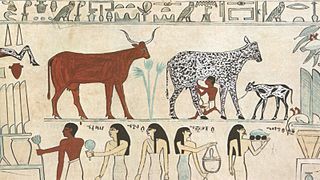 English: Old Egyptian hieroglyphic painting showing an early instance of a domesticated animal (cow being milked). Kaynak Scanned from 1000 Fragen an die Natur, via The Metropolitan Museum of Art, Rogers Fund, 1948. See below. 2D representation of ancient painting.